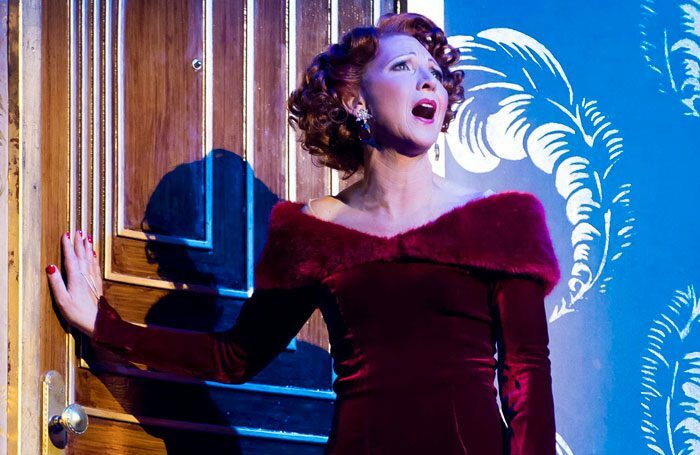 Waiting in the wings to make her first appearance as Dorothy Brock in the West End production of 42nd Street, Bonnie Langford had a “moment”. Because the Theatre Royal Drury Lane is where Langford made her professional stage debut aged just seven, in the 1972 musical production of Gone With the Wind. Her entrance for that musical – nearly 50 years ago – was in exactly the same place as her entrance in the dance extravaganza she has just joined. She’s not exaggerating. Since that debut, Langford has gone on to become a favourite of stage and screen, one of the UK’s best-loved, and most prolific, theatre stars. Her credits include being in the original cast of Cats, Me and My Girl, Gypsy – alongside Angela Lansbury, both in London and on Broadway – Sweet Charity and Dirty Rotten Scoundrels. 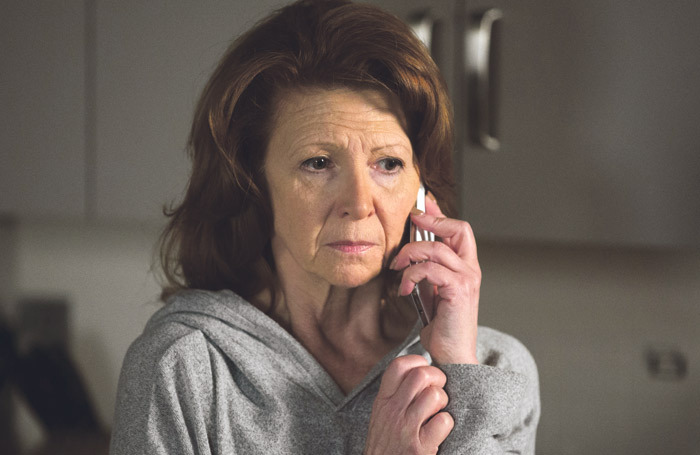 Her TV work, meanwhile, includes Just William, a stint as the Doctor’s assistant in Doctor Who in the 1980s, and, most recently, a three-and-a-half-year turn in EastEnders. Her CV is an impressive mix of theatre and television, from soaps to variety performances and reality television, and panto to musical theatre. Langford has never worked outside the entertainment industry and, judging by her CV, doesn’t appear to have taken many breaks, either. Langford joined 42nd Street direct from her stint in EastEnders, in which she plays Carmel Kazemi, a mother whose son was stabbed to death in a recent storyline. 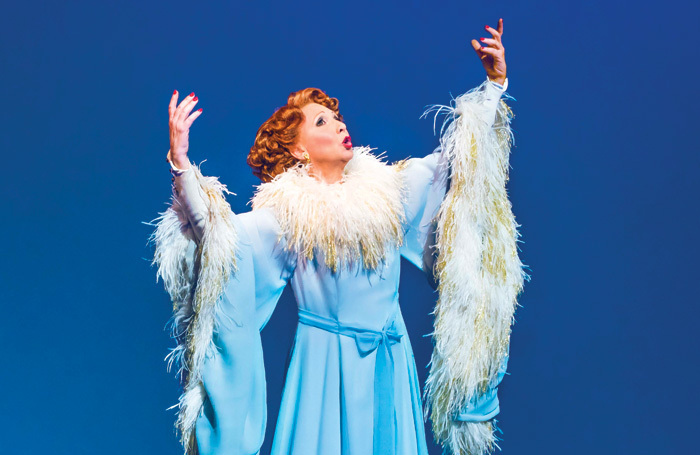 She had begun craving theatre again, she says – her last stage appearance was in Dirty Rotten Scoundrels three years ago. “At the beginning of the year I thought I needed to do some live stuff. I’d been thinking if it could fit around EastEnders that would be great, but if not that would be fine too,” she says. 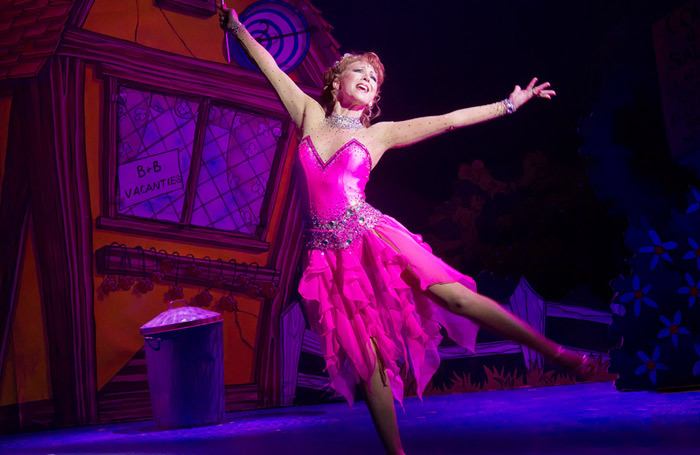 In the event, she left EastEnders, and began rehearsing for 42nd Street just two days later. Despite the intense two-week rehearsal period now followed by eight shows a week, being back in the theatre offers Langford a break from the “punishing” schedules of a soap. She adds that the shift to stage brings some regularity. Langford takes up the role of Dorothy Brock having previously appeared in a touring production of the musical, playing Peggy Sawyer. She is, she believes, the only actor to have played both roles. Her previous stint in 42nd Street was in the 1990s, but she wasn’t in a good place at that time, she says, and wasn’t able to enjoy the experience. She adds: “I was selling this scenario of going on stage and it being the most wonderful, magical thing, but I was not in a happy place.” Today, Langford says she has rediscovered that happy place, but back then was “tired” and thinking work “would fix my life”. With this in mind, Langford is glad to see discussions about the importance of looking after performers’ mental health taking centre stage in recent months. As she puts it, people may go to the gym to unwind, but you “need to go to the head gym too”. While that seems a surprise, Langford is diplomatic and instead focuses on the opportunities she had to talk to people who had experienced knife crime in their own lives. Gone With the Wind at the age of seven. Golden Girls, a tour with Maria Friedman and Lesley Garrett. Trust yourself, and listen. I was told when I was little to watch and listen to people – all people, from everywhere, not just the industry. And to value those people. My daughter, now. She is nearly 18 and is also at Arts Ed. When I was younger that person was Angela Lansbury, who I was in Gypsy with. She is still doing it [Lansbury is 92], and what an incredible woman she is. I saw the things she did off stage – she was a real-life human being and happy to show her flaws but was very, very kind. They are the worst – I can’t bear auditions. But I try to relax and listen. Langford is from a family with performance in their blood. 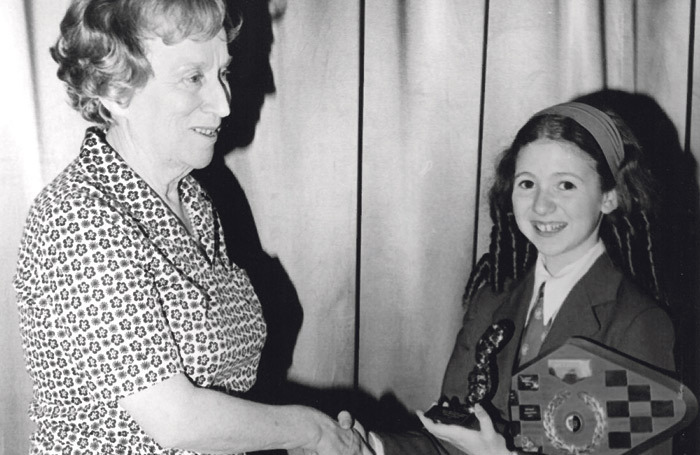 Her mum is still a dance teacher aged 88, and her great aunt danced with Russian prima ballerina Anna Pavlova. Langford’s nieces are the Strallen sisters, daughters of her sister, Cherida. Langford became an exception to this when she took up a place at Arts Educational Schools as a child and soon found herself cast as Bonnie Butler in the Gone With the Wind musical, having replied to an advert in The Stage. Arts Ed was not happy that she was performing professionally. “They did not approve,” she laughs. Not that it stopped her. Shortly after Gone With the Wind, she was cast in Gypsy, alongside Angela Lansbury. 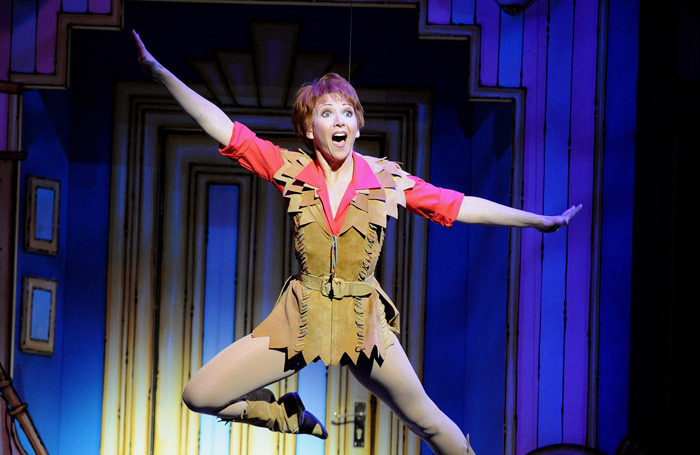 She appeared in the show in London before moving to Broadway to star in it for a year there. I am not very good at all that. I said to Lesley Garrett: “How do you look after your voice?” She said she sleeps a lot.I don’t go to bed very early and with EastEnders you had to get up at 5am. I can’t go to bed before midnight. It was great when I had to do my recent storyline, looking terrible, as I just didn’t care and it was great. I looked so dreadful, but it was fine. It was liberating. I didn’t have to put false eyelashes on and it felt great. It’s amazing to join a company like this, as the show is sorted and has worked out its problems. But it’s daunting to join an existing production, as you’re the new girl, you have to get up to speed very quickly. You feel everyone else knows what they’re doing and you don’t – it’s quite pressured. You feel in the spotlight, which I am not that good at. After Arts Ed, she joined the Italia Conti Academy of Performing Arts, but left aged 15 and landed a role in the original cast of Cats in 1981 at the New London Theatre, now named the Gillian Lynne Theatre, after the choreographer of that show. Since then, Langford has appeared in a number of other iconic musicals, not least Chicago, in which she has starred both in the US and in London. 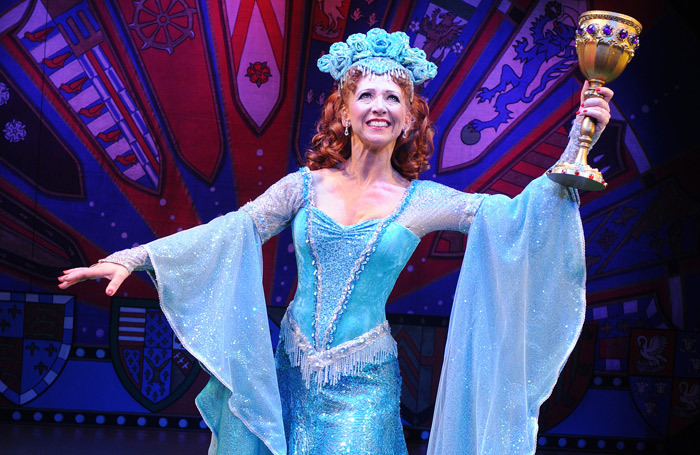 Other credits include Spamalot – “That was a lovely one,” she beams – and the tour of Dolly Parton’s 9 to 5. She gives the impression that 9 to 5 is one of those shows she would rather forget. “I don’t really know what I was doing there,” she laughs. During the audition, the panel asked if Langford could relate to working in an office, largely the setting for the musical. “I had to say I’d never been in one,” she laughs. Performing is all she’s ever known. Despite this longevity, it’s a surprise to learn she has never won any major theatre awards. It seems astonishing that a career as long as hers hasn’t furnished her with major accolades along the way. Her answers suggest someone who, despite her success, has her feet on the ground, and is realistic about life and the industry. We touch briefly on the idea of actors taking jobs outside of acting, when they are not performing – a topic that has hit the headlines recently, when US actor Geoffrey Owens, a former star of The Cosby Show, was ‘job-shamed’ after images of him working at a grocery store were widely published. Fortunately, Langford knows what her next job will be – touring with Maria Friedman and Lesley Garrett with a new album called Golden Girls. For now, though, it’s all about 42nd Street, which takes her to the end of the year. And while the critics will be in to assess her performance, she won’t be reading them. She avoids reviews “like the plague”, and says actors don’t do their job to “gain approval but to give people a wonderful night out”. 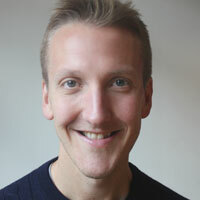 “We should be respectful of the fact people are spending a lot of money, and giving their time. You hope that time and money will be well spent, and that you give them something they can’t get anywhere else,” she says. However, there is one review that Langford has never been able to avoid. And it brings us neatly back to her debut on the stage of Theatre Royal Drury Lane in Gone With the Wind. In that show there was a horse called Charlie who, in the words of Langford, “did his business on the stage every night”. The horse’s dirty habit caught the attention of a certain playwright by the name of Noel Coward, who attended the opening night and reportedly offered some words of advice as to how he might be stopped.